Was it really a surprise at this point? A eye-popping number of Filipinos are now online. 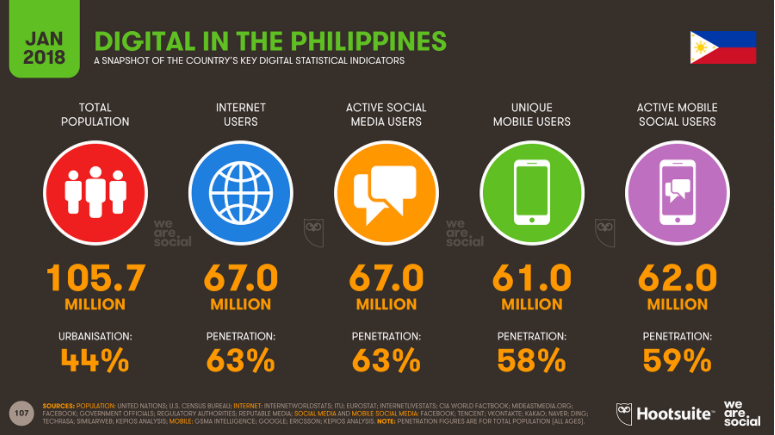 US-based Hootsuite found out that the Philippines is home to 67 million internet users as of January 2018. What does this mean for you and your brand? It clearly means that you need digital marketing now more than ever. The numbers prove that you should strongly consider SMS and Social Media Marketing as quality and efficient means of promoting your brand. Think of the thousands of those in the millions of people who are online and on mobile. Imagine the reach now that more people are reachable. Now, the only thing that matters is choosing the right tools to connect with these people just within your reach. And what better place to choose from than Busybee, a place where everything digital marketing’s at. BrandTXT & PowerBlast: Powerful messaging platforms that are set to target the people who are surely locked on their mobile phones now in just a couple of clicks. Beezmail: An easy-to-use and feature-packed email platform designed to get your messages attention and action. Creating beautiful emails and newsletters has never been simpler in a three step process: Upload, Compose, and Send. BeeSocial: We at BeeSocial have one mission: grow your brand online. As such, we follow strict steps to ensure that your online presence gets the best treatment possible. Our team carefully designs every social media campaigns from start to finish, highlighting a consistent brand voice for your business. Website Development: BUSYBEE offers professional website design and development services to help you successfully plan, create, maintain, and market your products and services effectively. Our strengths include fresh and creative graphic design, solid information architecture, and useful web interactive features including blogs, polls, e-newsletters, message boards, and forums. There are more ways for you to reach the many people who are online and/or on mobile now. Check out all the possibilities here at Busybee now: https://www.mybusybee.net/ for everything Digital Marketing or follow our Official Facebook Page at https://www.facebook.com/officialbusybee.textblast/ and contact (02) 929-2222 or (63) 917-837-200.